II. What one true excellence is there in the whole independent government in any one point, wherein it really differs from the presbyterial government? Take for instance a few points of difference. No other visible Church of Christ is acknowledged, but only a single congregational meeting in one place to partake of all ordinances. One general visible Church of Christ on earth is acknowledged, and all particular churches, and single congregations are but as similar parts of that whole. The matter of their visible Church must be (to their utmost judgment of discerning) such as have true grace, real saints. The matter of the Church invisible are only true believers, but of the Church visible persons professing true faith in Christ, and obedience to him, according to the rules of the Gospel. Their churches are gathered out of other true visible churches of Christ, without any leave or consent of pastor or flock; yea, against their wills, receiving such as tender themselves, yea, too often by themselves or others, directly or indirectly seducing disciples after them. Parochial churches are received as true visible churches of Christ, and most convenient for mutual edification. Gathering churches out of churches hath no footsteps in Scripture, is contrary to apostolical practice, is the scattering of churches, the daughter of schism, the mother of confusion, but the stepmother to edification. Preaching elders are only elected, not ordained. Preaching elders are both elected and ordained. Ruling elders also preach. Ruling elders only rule, preach not, 1 Tim. 5.17. The subject of church government is the community of the faithful. The subject of church government is only Christ’s own church officers. The church officers act immediately as the servants of the church, and deputed thereby. The church governors act immediately as the servants of Christ, and as appointed by him. All censures and acts of government are dispensed in single congregations ultimately, independently, without all liberty of appeal from them to any superior church assembly; so the parties grieved are left without remedy. All censures and acts of government are dispensed in congregational presbyteries subordinately, dependently, with liberty of appeal in all cases to presbyterial or synodal assemblies; where parties grieved have sufficient remedy. There are acknowledged no authoritative classes or synods, in common, great, difficult cases, and in matters of appeals, but only suasive and consultative, and in case advice be not followed, they proceed only to a non-communion. There are acknowledged, and with happy success used, not only suasive and consultative, but also authoritative classes and synods, in cases of great importance, difficulty, common concernment, or appeals; which have power to dispense all church censures, as need shall require. Let these and such like particulars in the Independent way, differing from the Presbyterial, be duly pondered, and then let the impartial and indifferent reader judge, whether they be not the deformities, at least the infirmities of that way. 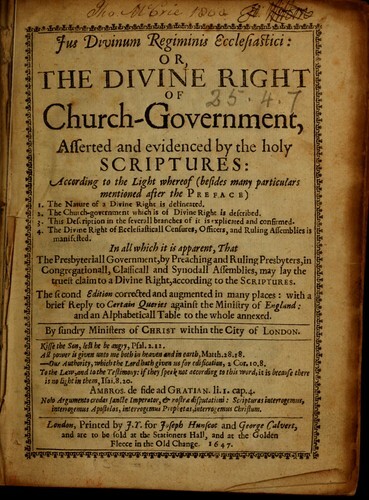 Excerpt from Jus Divinum Regiminis Ecclesiastici or The Divine Right of Church Government (1646) by the London Provincial Assembly.